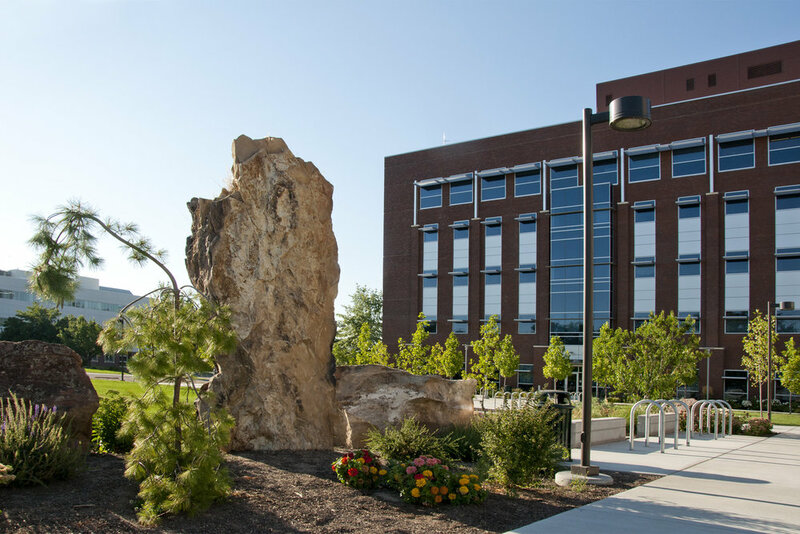 Boise State University Environmental Research Building — The Land Group, Inc. The Land Group was contracted to provide civil engineering and landscape architectural services on the 1.4 acre campus site. Collaborating with the design team, The Land Group produced an overall site master plan integrating the building within the campus context. Site details furnished by The Land Group include pedestrian circulation, building entry courtyard, enhanced concrete paving, brick paving, sandstone seat walls, landscape planters, bike parking, site furnishings, “green screen”, and ADA accessibility. The engineers contributed services for oﬀ-site street improvements, motor vehicle parking, service access, sewer and water utilities, and site grading and drainage. Following design development, The Land Group provided full construction documents, including bidding assistance and construction observations. This project was named as one of the "2011 Idaho's Top Projects" by the Idaho Business Review, and was published in its special section on July 15, 2011.